With Aquarelle, you can be sure the bouquet you ordered is the bouquet that will be received, at the address of your choice in Spain within 24h. Special offer: 4 € OFF! This week, Aquarelle's florists have selected these magnificent ‘White Naomie’ roses for their generous flowers and timeless beauty. This variety is known for its delicate, velvety petals and extremely long vase-life. The perfect gift to accompany all your messages with infinite elegance. These proud, generous 'Longiflorum' lilies will delight you with their immaculate white flowers. They are often mistakenly referred to as 'real lilies' simply because this is the favourite variety. Their striking flowers and heady fragrance have always made them the queen of garden flowers. Picked at the height of their season, they are now ready to unfurl to reveal their delicate yellow pistils and pure white petals. Special offer: 25 Tulips purple prince for only 25€! Aquarelle takes you over the rainbow with these beautifully vibrant tulips, a beautiful mix of flowers, colors and shapes in this combination. These flowers, originally from Turkey, have a dazzlingly simple beauty, guaranteed to fill your home with warmth and colour! Send someone a huge dose of happiness with these gorgeous tulips! We've created this charming small bouquet in passionate shades of red. Composed of opulentes 'Red Naomie' roses, pretty 'Nadia' alstromerias, superb green pompoms and a few branches of hypericum berries and ruscus, this adorably chic, vibrant bouquet will accompany your messages beautifully! Try a little tenderness with this unique combination of flowers and parfum. Our florists have combined these beautifully delicate multicoloured roses with a fragrant Rose scented candle. A deliciously stylish gift to accompany all your messages. Color and flavour in a delicious bouquet full of pleasant surprises of chocolate and sweets. The yellow flowers with a button shape create a funny arrangement to give as a birthday present or for special occasions to the most sweet-toothed of the house. Give a surprise with this unique bouquet, specially designed to express the sweetest feelings. Our inspiration came from the land of the rising sun when we added these charming bonsais to our catalogue: elm, sageretia, ligustrun and carmona. A long-lasting gift and a delightful surprise for exotic plants lovers. 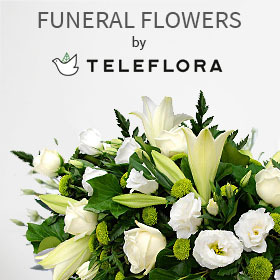 Looking for the best solution to send flowers to Spain? At Aquarelle, we design and assemble all our flower bouquets in our own workshops and deliver to homes all over Spain. 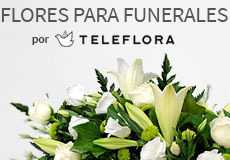 Do you want to send flowers to Madrid today? Express same day delivery in and around Madrid - we deliver your flowers the same day if you order before 14:00, including Sundays. Do you want to send flowers to Barcelona? Express 24H delivery of flowers in Barcelona. Monday through Saturday. 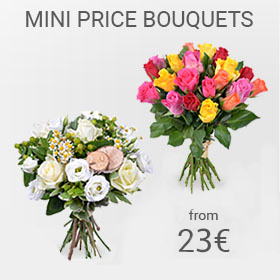 Aquarelle offers affordable delivery of flowers anywhere in Spain (except the Canary Islands): Valencia, Mallorca, Málaga, Almería, Alicante, Torrevieja. 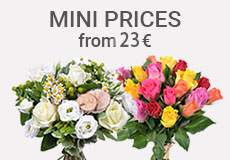 Aquarelle is the leading independent flower delivery service in Spain. We offer a large choice of seasonal flowers, bouquets and plants. With Aquarelle, send different varieties of flowers according to the season. We offer stunning compositions for yourself or for gifts, in natural bunches or harmonious mixed arrangements, as well as single variety hand-tied bouquets… Discover our magnificent floral creations, updated throughout the year according to the calendar.